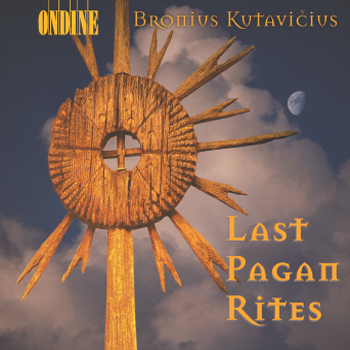 This CD contains two large choral works by Lithuanian composer Bronius Kutavičius. The oratorio Last Pagan Rites (1978) for mixed choir, solo voice, four horns, and organ is set to a text by Lithuanian poet Sigitas Geda. It combines archaic archetypes with mysterious, fantastic imagery, and includes the imitation of an ancient Lithuanian folk song ("sutartine") with its endlessly repeating invocations to nature. The world premiere performance was acknowledged as the most successful and significant Lithuanian musical event of the past half-century. This recording, made at the St. Casimir Church in Vilinius in 1996, features the Choir of the Vilnius Ciurlionis Art School under the direction of Romas Grazinis, together with soprano Gintaré Skeryté, organist Leopoldas Digrys, as well as four hornists: Mindaukas Budzinauskas, Linas Dakinevičius, Loranas Gadeikis, and Mindaugas Pupeikis. The symphony-oratorio Epitaphium temporum pereunti ("Epitaph to Passing Time", 1998) on texts from various sources tells of certain crucial moments in the history of the city of Vilnius, which in itself relexts the histoiry of the Lithuanian nation as a whole. On this recording, made at the National Philharmonic Hall in Vilnius in November 2000, the Kaunas State Choir and the Lithuanian National Symphony Orchestra perform under the direction of Robertas Servenikas.